A solar flare is an intense release of magnetic energy resulting in a massive burst of radiations. Flares are our solar system’s largest explosive events. They are seen as bright areas on the sun and they can last from minutes to hours. These are detected by the photons it releases at almost all the wavelengths of the light spectrum (ultraviolet, infrared, etc). Flares are monitored by scientists thru X-rays and optical lite. During solar flares, particles such as electrons, protons, and other particles are accelerated. 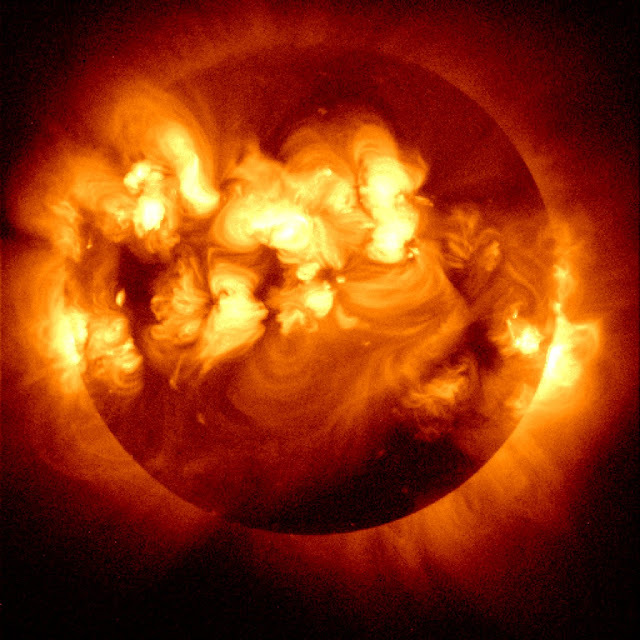 Solar flares wrecks havoc on orbiting satellites, spacecraft and equipment. They also generate strong geomagnetic storms that can be seen as Aurora Borealis (Nothern Lights) or Aurora Australis (Southern lights). The sun erupted late on January 22, 2012 with an M8.7 class flare, an earth-directed coronal mass ejection (CME), and a burst of fast moving, highly energetic protons known as a "solar energetic particle" event. The latter has caused the strongest solar radiation storm since September 2005 according to NOAA's Space Weather Prediction Center. Ironic that the Chinese New Year, based on the phases of the moon, started with a strong solar flare. At around 4:00 GMT, an M8.7-class solar flare exploded from Active Region 1402. NASA SDO captured this event and thanks to ESA/NASA SOHO and NASA STEREO Behind spacecrafts, we have also learned of a very quick moving Coronal Mass Ejection (CME). The CME is traveling at approx. 2,200 km per second and the Goddard Space Weather Lab predicts the arrival of this CME on earth to be January 24, 2012 at approx. 14:18 GMT (+/- 7 hours). It also shows that Mars will get hit too, several hours after Earth. NASA's Goddard Space Weather Center's models predict that the CME is moving at almost 1,400 miles per second, and could reach Earth's magnetosphere, the magnetic envelope that surrounds Earth. This has the potential to provide good auroral displays, possibly at lower latitudes than normal. The outer solar atmosphere, the corona, is structured by strong magnetic fields. A Coronal Mass Ejection happens when these fields are closed, often above sunspot groups, because of this, the confined solar atmosphere can suddenly and violently release bubbles of gas and magnetic fields. A large CME can contain a billion tons of matter that can be accelerated to several million miles per hour in a spectacular explosion. Solar material streams out through the interplanetary medium, impacting any planet or spacecraft in its path. CMEs are sometimes associated with flares but can occur independently.